Austria – is there an emergency plan for Eastern Europe? Back in January this year experts from the EZB, IMF, EBRD and Austrian government together with representatives from the largest banks in the country met almost secretly to what has been called ‘Gedankenaustausch’. Officials denied it was a crisis meeting but rather a swapping of ideas about how best to meet the challenges threatening the stability of the country coming form Eastern Europe. The professor does not even deem it controversial and yet Austrian officials both from politics and financial industry maintain the crisis is manageable and not as bad as some might fear. Walter Rothensteiner CEO of Raiffeisen Zentralbank (RZB), one of Austrian’s biggest banks, does not agree with international organizations like the IMF that his bank will need more government funds in 2010. Of course those funds are expensive. So far RZB has requested 2.5 billion euro from the government (that’s almost 30 percent of core capital!). Rothensteiner refuses to make any projections about the magnitude of possible NPLs in his firm. Recently economist Paul Hilbers, head of IMF’s monetary and financial systems department, downplayed the threat coming form Eastern Europe. “We don’t see a threatening default scenario. Austrian banks are facing a difficult time in Eastern Europe, but I wouldn’t call them threatened," Hilbers said. Today the OECD again warned of more risks to the financial stability of the country through its heavy Eastern European exposure. They recommend to the Austrian government to prepare emergency plans in case the financial and economic crisis should get worse. In addition OECD experts suggest further cross-boarder initiatives to handle the crisis. There are no official emergency plans known. Maybe they do exist though. Even the OECD admits so far Austria has weathered the storm better than others, but I sincerely hope that politicians and experts do not turn off electricity entirely when they all go on vacation in the coming months. Better yet hopefully there will be no emergency at all, at least not in the months of July and August. This weekend finance minister of the G-8 nations gather in the south of Italy hopefully not only to take a sunbath. While leading economists are still warning of high uncertainty regarding growth and systemic risk for financial contagion still lingers the G-8 finance ministers are already discussing a possible exit from fiscal and monetary stimulus programs. This seems premature. The subprime fiasco seems largely over but other problems prop up in particular in Eastern Europe. This region of the former communistic Soviet Union is a going concern. While some of the worst fears are probably exaggerated systemic risk and possible contagion for some Central European banks still lingers. Banks in Austria, Germany and Sweden have 1.6 trillion US dollar loan exposure in the region. Of particular interest is the Baltic mini-state of Latvia. GDP of Latvia was 36 billion US dollar in 2008 but problems might spread to neighboring countries yet and get out of control. 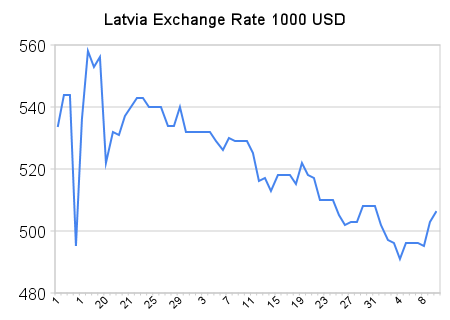 Just recently foreign exchange markets got upset by failure of Latvia’s bond auction. Sweden is Latvia’s biggest creditor and its banks have heavy exposure to the Baltic state. Recently Sweden’s Riksbank borrowed 3 billion euros from the ECB. That shows how serious the situation is. The bank is drawing down on a 10 billion euro swap agreement. Latvia is now in negotiations with the IMF to secure another round of funding, but first it has to implement spending cuts and restrictive fiscal measures, which could further dampen the outlook for growth and lead to even higher unemployment. But Latvia is not the only problem. About a third of fund managers polled expect more Eastern European countries to default and about 11 percent expect a full-blown systemic meltdown. This has prompted the ECB to issue a warning for 2010 rather than 2009 if the recession lingers. According to the European Commission 27 EU states have so far pumped 3.7 trillion Euro into rescuing the banks, that’s almost a third of European GDP. Out of that pool 311 billion have been in the form of direct capital injections, that is more than US banks received. In the meantime the German government has agreed to implement a ‘bad-bank-model’ where large regional banks, like the German Landesbanken, will be able to transfer their bad investments worth about 600 billion euros until 2010. A similar drastic measure might be necessary for Austrian banks too. It seems to be a weird coincidence that this dumping institution for bad assets has been named after a beautiful Italian opera, AIDA. Complicating the situation is a moldering conflict within the IMF, where funding in the US seems to be called into question. A proposal to send $108 billion is attached in a supplemental appropriations bill to fund the wars in Irak and Afghanistan. While funding for the wars is most likely to be approved the IMF has come under criticism, mainly because of lack of economic stimulus measures among European states. Republicans and Democrats in the House of Representatives oppose the fund because they fear that the money will mainly be used to bail out Central European banks. If the administration will fail to garner sufficient votes they can pull the funding bill out and support a war-only funding bill. That’s a smoking gun for Eastern Europe and Central Europe alike. will it cause a snowball effect? No doubt there is dramatic financial and economic danger looming in Eastern Europe, which has the potential to prevent a recovery from the World financial crisis. It is often compared to the Asian crisis of 1997/98, which led to Russian default and eventually caused a major hedge fund in the US to blow up and the Federal Reserve to intervene. The situation in Eastern Europe is regarded as even worse than its Asian counterpart. But is it really true? Looking at two major indicators, current account and gross national debt, offers valuable insight into government finances. As Mary Stokes from the RGE Monitor reports Eastern European countries had current account deficits ranging from about 2 percent (Czech Republic) to almost 25 percent (Latvia) before the crisis struck. Current account deficits in Korea, Indonesia, Philippines and Thailand were also negative in 1997 at –1.5, –1.59, -5.17 and –2.06 respectively, but turned abruptly positive in 1998 at 11.11, 3.79, 2.26 and 12.77 respectively. 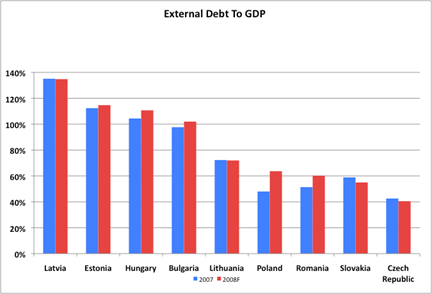 Deficits also improved markedly in Eastern Europe in 2008. This cannot be seen as an improvement and actually results from a total collapse in internal demand. Correctly the author points to high debt to GDP ratios ranging from 40 to almost debilitating 140 percent among some Eastern European countries. Stokes compares this to the seemingly low levels of external debt in Thailand in 1997 and 1998. According to data from the Asian Development Bank debt to GDP ratios in major impact countries were disruptively high during 1997 and 1998. The author was referring to the only positive exception, Korea. Looking at the scope of international intervention and support leaves little doubt that East Asia in 1997 far outranks the crisis in Eastern Europe. The IMF has pledged 80.2 billion US dollar so far, most of it in the form of SBA’s to the region. The European Bank for Reconstruction and Development (EBRD) has committed another 3.1 billion. That compares to a total of 240.5 billion during the Asian crisis, according to the Congressional Research Service report for US Congress. But the battle royal continues. So we shall see. Will Eastern Europe blow up? Many economists from Krugman to Evans-Pritchard predict financial and economic disaster among nations in Eastern Europe. Some of which probably might default and their governments collapse. A dire scenario which will pull down the world economy and the European political and monetary union. 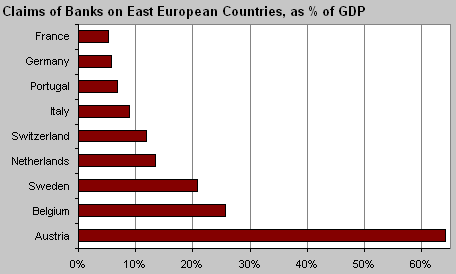 The faith of eastern Europe is therefore crucial to the faith of the world economy in general. The Asian crisis of the late nineties has many similarities to today’s crisis in Eastern Europe. Many Asian economies suffered from high debt to GDP ratio, high current account deficits, high currency volatility and a high level of indebtedness in foreign currency from public and private households. So do Eastern European nations today. A strong improvement in the current account deficit seems to be key development during times of economic crisis. Thailand saw an improvement in the current account from minus 7.9 percent to plus 12 percent. Latvia’s deficit improved from minus 22 percent to minus 5 percent. This seemingly positive but really unfortunate development is caused by a slump in internal demand. Asian economies could count on strong external demand for their recovery, something that is not the case in this crisis for Eastern Europe, at least not for now. How dramatic the situation really is became evident from a report of the UN Conference on Trade and Development (Unctad), which states that foreign direct investment (FDI) has collapsed in the region in the first quarter of 2009. In 2008 developing countries boosted FDI inflows by a 7 percent annual growth rate, mainly due to strong performance in the major BRIC countries. However in the first quarter Unctad registered a nosedive in capital inflows to both rich and poor countries. Without this capital inflows it will be much harder to achieve economic recovery. Not only are private investors more cautious also major rating agencies keep their focus on the sovereign ratings of Eastern European countries. On 23 April, Moody’s Investor Service affirmed Estonia’s A1 rating but left the outlook negative. Moody’s justified the negative outlook by the slump in external demand from Latvia for example. Standard & Poor’s and Fitch also left the ratings outlook negative. Some countries like Ukraine and Hungary have already applied for financial support by the IMF. Recently Fitch announced that it expects Croatia to apply for IMF assistance. Help from the IMF and other international organizations seems to be forthcoming. This is undoubtedly a good development and should help to stabilize their economies. The currencies of most Eastern European countries have stabilized and even improved in the last two month. But since the world economy is still deep in the whole real recovery might be far off, and that is probably what is necessary to prevent another “Asian” crisis from happening.